yesterday I gave myself a day off and spent the day with John and my Mum, Dad, Sister & Niece who had come for a visit. Lots of chatting was done, lots of tea & coffee was drunk, we had a bracing walk on the windy seafront (!) and wasted quite a few 2p's playing games on the pier...a lovely day all round! afterwards I cosied up on the sofa and cut, folded and stitched the evening away! 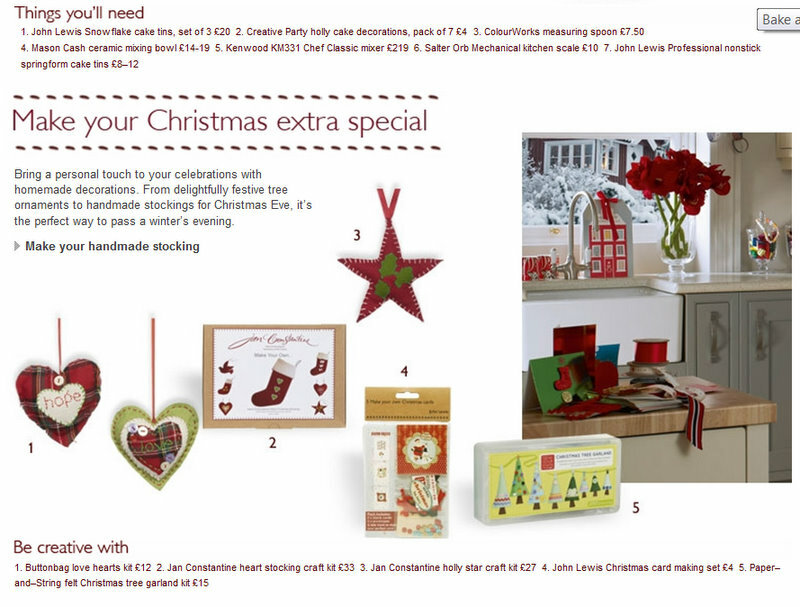 My Christmas Tree Garland has been featured in a John Lewis email which they sent out to customers today...I'm not signed up but my friend Jackie *hi Jackie* is and she sent it over for me to see...what a good way to end a Friday! I've been busy counting and sorting and re-stocking my shop with lots of basics...all the orders were being placed over the last week or so and some have finally started to arrive (yay!) first the postman arrived with lots of metal: which means my findings pots are nice and full: and then the courier bought a BIG box of buttons: literally hundreds and thousands of polka dot buttons....AND...because I couldn't resist: yellow polka dot star buttons! 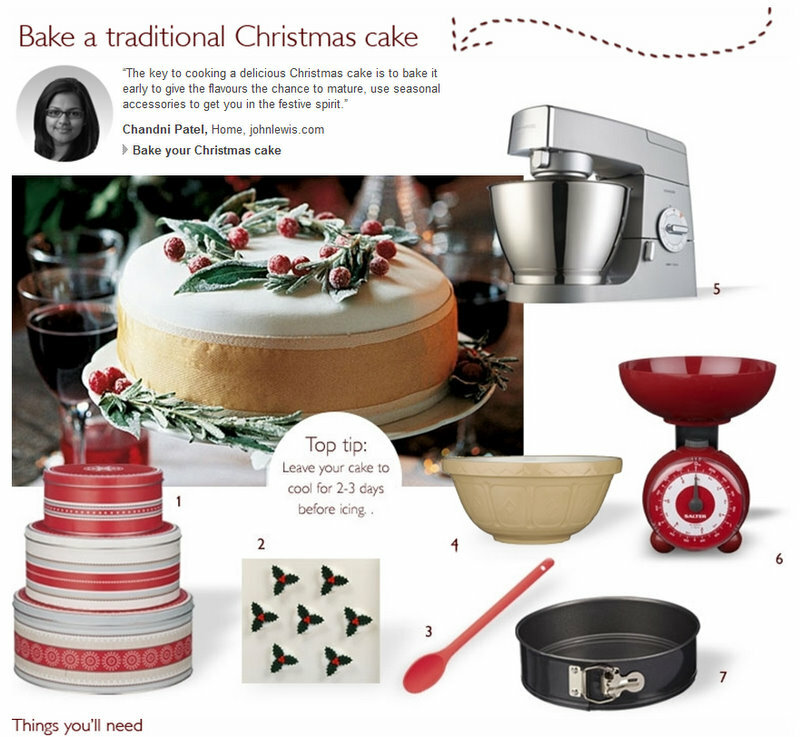 Perfect for Christmas crafting. there's lots of sewing being stitched round here at the moment...this little lot is a wholesale order for a new customer, there are 42 mini cupcakes, 20 Christmas trees and 24 Christmas puddings, all finished and ready for the postman tomorrow...tonight there are Christmas decorations & boxes to stitch...I'll be back with photos tomorrow! a comment was left on my previous post and it contained a link to an outside site, when I clicked on it my computer (thankfully) warned me that there was malware attached to it and it wasn't safe to proceed...I have removed all traces of the comment now but I didn't do it immediately so there was an hour or so in which you may have clicked it...the comment was left by a regular blog reader and I'm sure no malice was intended...sewmbie if you read this I can't email you or leave a comment on your blog...but I didn't delete your comment because I didn't like it...just that the malware scared me! button boxes with lots of new buttons...there are 11 boxes altogether The hard-to-find magnets have finally returned! I've re-packaged my Christmas Ribbon mini spools AND look at my new pom pom trim!! Today I started adding some new things to my shops, starting with :: Christmas Decorations! I've re-drawn my Pudding decoration ... designed a new Tree decoration... ..and added a pom pom scarf to my snowman decoration... ...the pom pom scarf makes me ridiculously happy!! They can all be found in my NOTHS shop, etsy shop or on my website! This weekend I am planning on spending a lot of time online....I need to fill my Not On The High Street shop up, start listing on Folksy again and update my eBay & etsy listings...quite a big task! Luckily a big part of doing it means I get to play with ribbons and buttons whilst pretending I am working very hard indeed!! 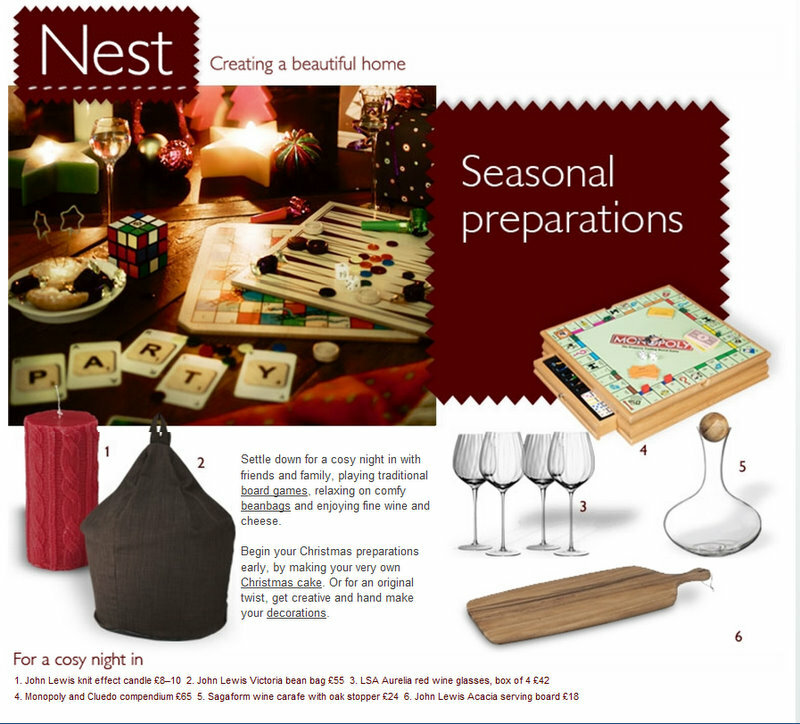 my latest order to John Lewis has been sent .... which left me needing to do a ginormous tidying up operation! I still have 2 more smaller orders to make and send to John Lewis but I won't need so much space which means there's now more room for everything else!...no more boxes on the stairs...no more boxes on the landing...no more boxes in the kitchen/bathroom...you get the idea! I started on Saturday and it took me all day....it was hard work, but it was so much fun! ...my desk is clear(er) and I've sorted out places to put all my paperwork & printing stuff the cupboards are full ...and orderly... ...I've stored all the kit bits in these boxes (stickers, instructions etc) ...The small room is the best bit...proper neat & tidy boxed up storage ...the amount of boxes will shrink as I make more kits .... and an actual mini stock room: all the extra felt bolts are here with a little bit of space for other stock...moving the felt means that my packing room has been cleared... ...look, you can see the carpet and get through the door!! I've tidied and re-arranged some shelves, but haven't quite done them all....that's for next weekend! last night I put the finishing touches to 3 new designs :: BOO! did they scare you? nope, me neither, they are much too cute! Little felt Halloween decorations ... and the best bit? I have made a free pattern so anyone & everyone can make them! 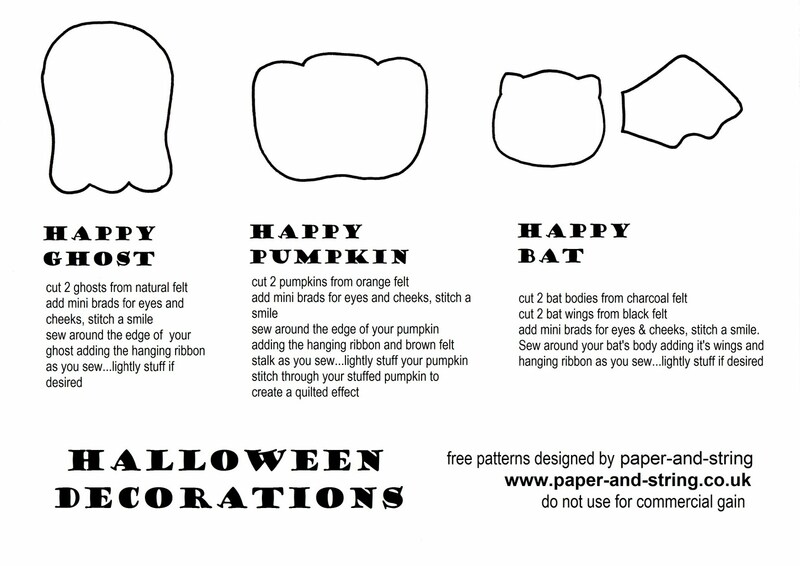 So whether you'd like to make a Happy Pumpkin :: a happy Ghost :: or a Happy Bat :: just click the picture below to print off your free patterns & instructions and get ready to sew, sew, sew! 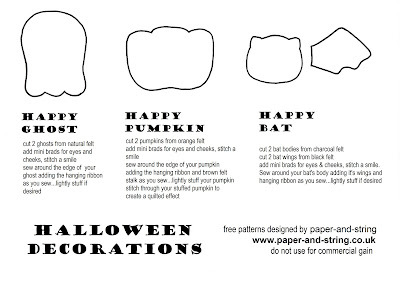 I've also put the pattern on flickr for you to download/print off...happy halloween sewing! for the past few days I've been busy sketching and cutting and gathering supplies for some new felt ideas that have pinged into my brain.... ...and after I've tidied up my messy workshop, put away my cardboard box delivery and been to the post office I will be going home early for an evening of TV and sofa sewing! throughout the freebie I was asked a lot of times if the freeebie kit would be available for sale...I hadn't planned on it but I have just priced it up and added it to the website for those who are interested....all the contents would cost £25.83 to buy separately (+ the box) but I have listed it at £20 which is a 20% discount (and a free box! )...there are only 10 up for grabs so be quick if you want one! ******************************************* oooohhhhhh look what I got! I've been buying Christmas goodies! 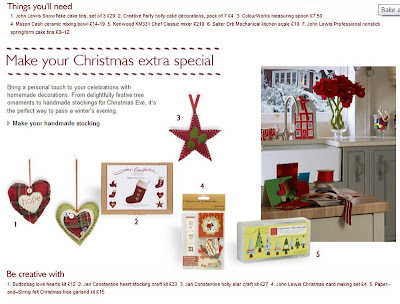 ...including all the new designs, and some Christmas Basics too! 2 reels of sewing thread, fluffy pom poms, polka dot buttons, star buttons and jingle bells! Freebie closes on Tuesday 11th October and the winner will be announced shortly afterwards.